I am currently advising an author who is working on a book documenting the history of various airline no longer with us and he will be using the following photos to illustrate some chapters. With his permission I have included them below. My Grandfather was a regular user of Imperial Airways to fly between our estate in Rhodesia and the UK, used to take days ! The map here shows how Imperial passengers in 1934 could get from London to Singapore at a cost of £180 (about £10,900 or $17,600 when adjusted for inflation). A good deal since it included the hotel accommodations, food, and nearly everything but the alcohol was included in the price. The 8,458 mile trek took 8 days and included stops in Paris, Brindisi, Athens, Alexandria, Cairo, Gaza, Baghdad, Basra, Kuwait, Bahrain, Sharjah, Gwadar, Karachi, Jodhpur, Delhi, Cawnpore, Allabad, Calcutta, Akgats, Rangoon, Bangkok and Alor Star. Great pics Charles and a epic trip -landing/stopping in some of those places in those days must have been fascinating. Pictures here is the route operated by Imperial Airways in conjunction with QANTAS that enabled flights between the UK and Australia. Great photos, and information, Charles and Peter. Thanks a lot! Would be interesting to hear about the behind the scenes logistical issues. Crew operating hours….. crew rest…. security issues… restocking of supplies…flight planning etc etc..
A fascinating book by an author who retraced, on modern aircraft, the stages of the old Imperial Airways route to Australia, is Alexander Frater’s ‘Beyond the Blue Horizon’. Well worth getting hold of a copy. He’s written a number of other superb travel books. During a recent spring clean I found a copy of BA Highlife from May 1990. Not quite as far back as Imperial Airways but still made interesting reading. Articles included the arrival of the 767, all named after European cities. Instructions in five languages on arriving at London airports/transferring at LHR/LGW/between them and how to get to Central London from both. Extensive route maps, showing Concorde flights to Orlando. Skysound offered a chart show presented by Bruno Brooks and music selections from Andre Previn, DLT and Michael Aspel. Skyvision showed ITN News, Parkinson meets Cliff Richard and Skyflyers Video Show. Movies on offer included Driving Miss Daisy, Look Who’s Talking and The War of the Roses. Duty Free spirits were sold in half-litre flasks; sample prices Gordons Gin at £3 and Johnnie Walker Black Label £7. No “Z List” celebrity fragrances here; Chanel No5 and Kouros amongst the offerings. Wide range of products/services offered in full and half page ads, including fur coats! 1960 fares. In inflation adjusted terms, fares in 1960 were about 30 times more than now, for example £55 for a return to Berlin, which is the same amount of pounds as now if you get a cheap flight. On board, smoking was allowed (yuck! ), and you could buy a packet of cigarettes for 2/0d. A G&T was 1/9d. In those days, happy days, flying was for the elite and not the riffraff of nowadays. However, as I often say, I love Ryanair as they keep 100 million people a year off the airlines I choose to travel on. Also have BEA Winter 1968/69 British Isles timetable, including the helicopter service between Penzance and Isles of Scilly. The jet age had arrived as the Comet, Trident and BAC Super 1-11 operated on some flights BHX-GLA, LHR-GLA, LHR-MAN and LHR-BFS. My first jet flight was LHR-BHX on a BEA Trident, August 1967. I’ve got (somewhere!) the flight bulletin that was passed around informing passengers of aircraft type, registration, Captain FO and Senior Flight Attendant names, flight data relating to time/altitude/speed. capetonianm #807348 mentioned the book by Alexander Frater “Beyond the Blue Horizon”. It is an interesting read in the days of flying boats, breakfasting at 5am, in order to take advantage of the daylight hours and all the titbits which take us back to the 1930s. I should mention that Strike Force Entertainment in their series on British Civil Aviation has produced three DVDs covering the period 1924 to 1974 when the present British Airways came into existence. 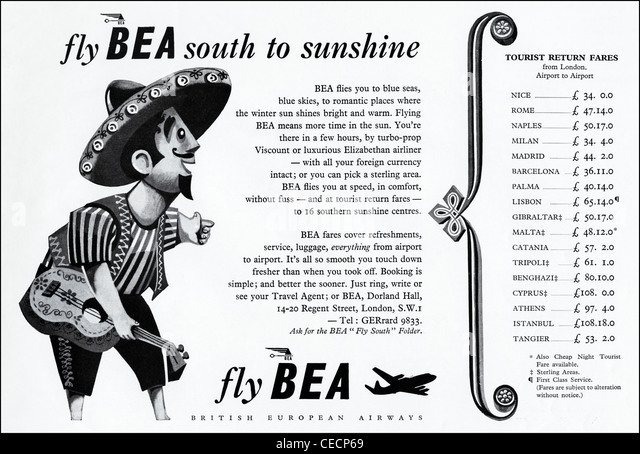 They deal with a)Imperial Airways b) BOAC c) BEA. All are subtitled “The Definitive Newsreel History”. They last respectively a) 111 mins. b)172 mins. c) 154 mins. thus there is material to enjoy. Books there are many but I mention one published in 2016 by Amberley Publishing compiled by Paul Jarvis in association with British Airways called “Mapping the Airways”. It provides a plethora of different maps and brochures produced from the days of Imperial Airways to XXI Century.It is a fascinating book both in content as well as visually. It is well worth buying. Interesting that second BOAC poster indicated that everything was included, even tips – but not drinks. So BOB isn’t new after all!! KLM have many posters through the decades, also easily found. Colourful, bold and listing the price per sector. Often colourful, cleverly constructed,they tell the whole passenger experience..
A Beautiful few years of Aviation history through the ages, can be seen, for other Airlines also. KLM ate The Worlds longest / oldest Airline of 97 years!